The fortified city at Golemo Gradište is situated approximately 40 km south of Skopje. It consists of 1) an elongated elevation stretching in the direction E/W, or the acropolis, at an altitude of ca. 440 m; 2) a wide sloping terrace between the north foot of the acropolis and the river Kriva Reka and 3) the narrow area between the south side of the acropolis and the lower massif known as Malo Gradište. Systematic excavations of the North Terrace began in 2005, the area believed to have been the site of an urban settlement. Four trial excavation areas were excavated within a rectangular space 20 x 40 m in the central part of the terrace, near the foot of the acropolis. Trial excavations revealed short street segments, a canal and walls which belonged to several architectural structures. The walls are built of stone and mud mortar and some of its sections up to almost 2 m high survive to this day. Several phases of building and reconstruction have been recorded, while the unearthed arrowheads and cannonballs are indicative of the reasons for building a series of structures and their destruction. The streets were paved with pebbles and their surface was made of beaten earth. With only one exception, the streets follow the direction NE/NW. The pottery and other finds indicate that this was the residential quarter of the city. Due to the limited scope of the excavations, no substantial conclusions could be made; however, it appears that the settlement on the North Terrace was founded in the 5th century, probably in its second half. Life in the city continued in the 6th century. 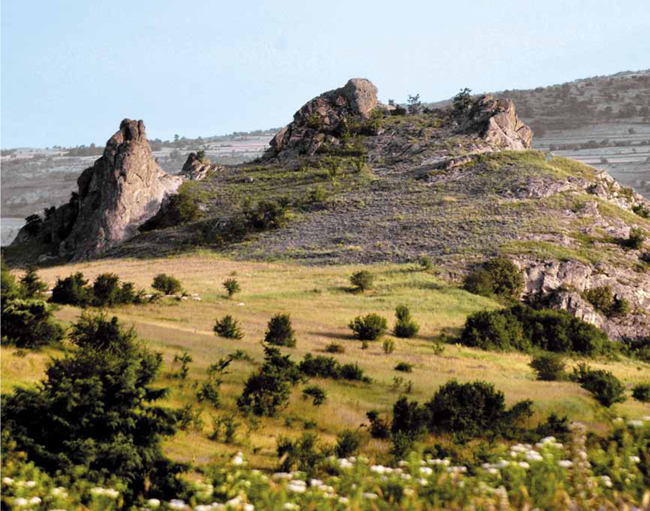 The fortress on the acropolis of Golemo Gradište was founded in the second quarter of the 6th century and it is highly probable that it was part of the renewed fortification of the empire carried out by Justinian. The fact that the city was situated in a mining region, as well as its position which follows the line along which other fortifications of the Roman E/W road were built, and which passed through the valley of the river Kriva Reka, suggest that this city had and important strategic function in this region in Late Antiquity. Radojchich S., 1952, Crkva u Kowuhu, Zbornik radova Vizantoloshkog instituta 1, 148-167, Beograd. Mikulchich I., Antichki gradovi kod Drenova i Konjuha u Makedoniji, Arheoloshki pregled 15 (1973) 179-182, Beograd. Snively, C. 2002, Golemo Gradište at Konjuh: Report on the Excavations in 2000, Dumbarton Oaks Papers 56, 293-302, WashingtonDC. Snively C., Golemo gradishte, Archaeological sites, Cultural heritage protection office, Skopje 2009, 88-89.